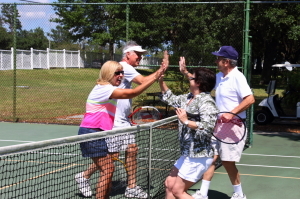 There are many nice retirement communities in the Tampa Bay area. But, none are quite like StrawBerry Ridge, a 55+ community in Valrico that affords its residents the ability to lead the sun-filled Florida lifestyle in a way that’s highly affordable. Strawberry Ridge, which is one of five retirement communities in FL owned by Blair Group, is an 867-lot gated property featuring a wealth of onsite amenities, many recently renovated homes, and a community vibe that reflects the laid back, fun-seeking approach that our residents take to being retired. Our retirement community is one in which having fun, staying active, and relishing the Florida weather isn’t just acceptable, but expected. There is always something interesting going on at StrawBerry Ridge. One factor that really makes StrawBerry Ridge stand out among all the retirement communities in the Tampa Bay area is the fact that a select number of our homes have recently undergone extensive renovations. Keeping our homes contemporary simply is part of our ongoing commitment to running a community that is conducive to pursuing a fun and relaxing retirement lifestyle. In order to truly understand what it is that sets StrawBerry Ridge apart from other retirement communities in the local area, we highly recommend that you visit our 55+ community in person and see what we have to offer up close. Contact a member of our Lifestyle Team today to schedule a tour of StrawBerry Ridge. We think you will be impressed by what we have to offer over and above other retirement communities in the Tampa Bay area.